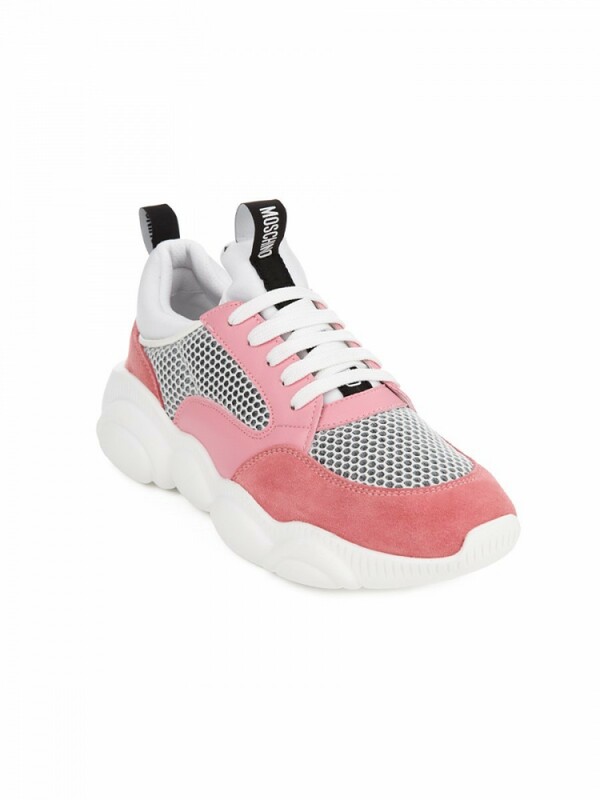 The renowned Italian fashion house, Moschino, presents an adorable trainer style with a sports-luxe appeal to it; perfect for your weekend wardrobe. As Spring is approaching, it is the ideal time of year to infuse your shoe-collection with a hint of baby pink and match those seasonal cherry blossoms! Our favourite Moschino Pink & White Teddy Run Trainer is crafted with a leather upper, features a pull tab at the rear, lace-up fastening, mesh upper, white rubber sole and is designed with bolts on the front and back with contrasting jacquard logo. The rubber sole is masterfully constructed in a teddy bear shape, staying true to the designer’s playful and fun-filled vision. An off-duty staple, which guarantees a striking look while denoting femininity and teddy bear- like vibes.